You are here: Home / About Howard County Library System / History / Celebrate 75! Within this bench rests a Time Capsule that captures the essence of Howard County Library System (HCLS) in 2015, our 75th Anniversary. Its contents reflect our unwavering heritage as a 20th and 21st century educational institution with a mission to deliver equal opportunity in education for everyone through a curriculum that comprises Three Pillars: Self-Directed Education, Research Assistance & Instruction, and Instructive & Enlightening Experiences. To connect our past, present, and future, HCLS appointed 136 Howard County middle school students to serve as Guardians. On October 24, 2015, they pledged to champion the HCLS legacy, keeping it safe for the next 25 years. October 27, 2040 – The Class of 2015 will reconvene to pass on the role of Guardian to the next generation (Class of 2040). Together, the two generations will open and reseal the 2015 container, then fill the 2040 container. October 24, 2065 – The Class of 2040 will gather to pass on the role of Guardian to the Class of 2065. Together, they will open and reseal the 2015 and 2040 containers, then fill the 2065 container. October 21, 2090 – The Class of 2065 will gather on the occasion of Howard County Library System’s sesquicentennial (150th) anniversary to open the Time Capsule. Dedicated this 24th day of October, 2015 to the always forward looking citizens of Howard County, Maryland. Howard County Library Systems’ journey from 1940 to today’s 21st century model library is cause for celebration. “Celebrate 75! A Community Anniversary Fest” drew 1,600 people to the HCLS Miller Branch on Saturday, October 24 to mark the landmark year! The opening ceremony featured 136 Howard County middle school students who pledged to carry on the HCLS legacy as Guardians of the Chapters-of-Our-Lives Time Capsule. All middle schools were represented, and the students placed their photos along with their answers to the three application questions into the 2015 capsule. Learn more about the Chapters-of-Our-Lives Time Capsule and the Guardians. #HCLS75 on the Road! 58 cities, 6 countries and 4 continents! Thanks to everyone who took our red HCLS75 along with them on their summer trips! Every photo we received earned the submitting individual a chance to win movie tickets and a fun friends and family movie night at the Library! CONGRATULATIONS TO OUR WINNER LORRAINE CLEMMER! Click on the star on the map to see where the winning entry photo was taken. Picture Yourself Part of #HCLS75 History! 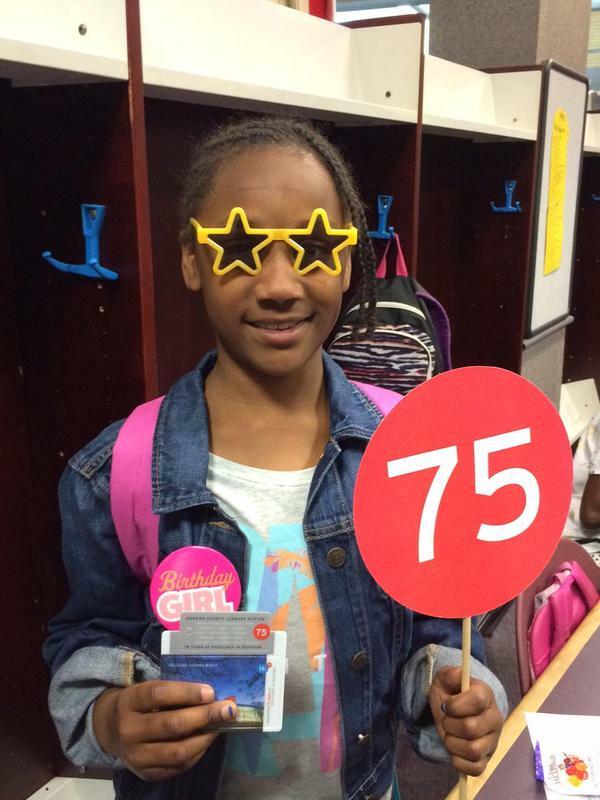 Congratulations Delani Thomas, East Columbia Branch Customer, winner of the Howard County Library System RED75 social media photo contest. Delani receives a Kindle reader and the opportunity to select, inscribe, and place her favorite book in the HCLS 75th anniversary time capsule at a ceremony in the fall. Howard County Library System is celebrating its seventy-fifth anniversary year with a special gift to the community. A series of six, commemorative library cards are now available to both current and new customers at all branch locations. The new cards feature beautiful photographs of HCLS’ six branches at dusk. The new design also features the anniversary logo and slogan,”celebrating 75 years of excellence in education.” Switching to or choosing the new card is optional and there is no charge to customers. Howard County Library System marks the beginning of its diamond anniversary year with a fundraising gala that dazzles from beginning to end. Guests attending the 2015 Evening in the Stacks gala take an opportunity to talk about HCLS and the important role it plays in the community in the video below.